POLL: Dem Doug Jones Surges Against Roy Moore - Joe.My.God. Republican Roy Moore, the anti-Republican establishment candidate, is tied at 42 percent apiece with Democrat Doug Jones in the U.S. Senate race in deep-red Alabama. 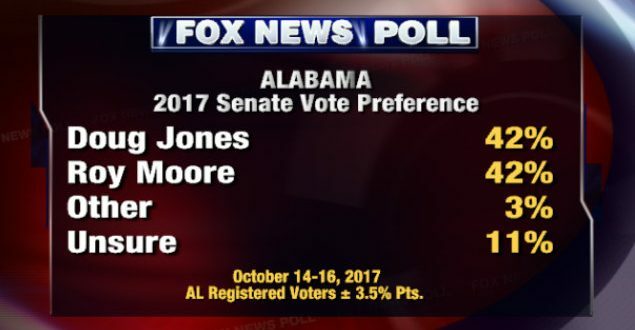 A Fox News Poll also finds that among just the 53 percent of Alabama registered voters who are extremely or very interested in the race, Jones has a one-point edge over Moore (46-45 percent). The special election to fill the U.S. Senate seat vacated by U.S. Attorney General Jeff Sessions is December 12. The poll, released Tuesday, shows 42 percent of Moore’s supporters have some reservations about their candidate. For Jones, that number is 28 percent. Plus, 21 percent of those in the Jones camp say they’re voting against Moore as opposed to for Jones. That’s three times the number of Moore supporters who say their vote is based on dislike of Jones (7 percent).